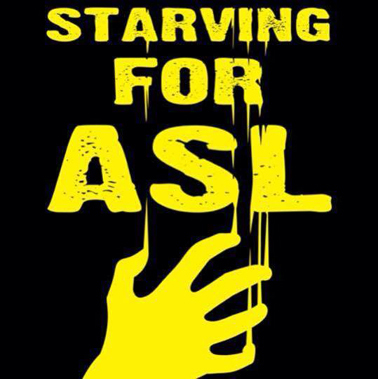 Just about everyone in the Deaf community knows about the chain of hunger strikes launched in Fall 2015 to protest anti-ASL policies at the Western Pennsylvania School for the Deaf. A number of Deaf people have already partipated, or are participating. Swanhilda Lily, themost prominent of the hunger strikers, has direct connections to WPSD. She attended California School for the Deaf-Fremont, Arizona State Schoolo for the DEaf and Blind, WPSD, and graduated from Model Secondary School for the Deaf. So she has gained a great deal of firsthand experience. "I'm currently in Gallaudet’s graduate Sign Language Education program; I recently earned a B.A. in ASL.” She lives in Denver and has two CODA sons, ages 13 and 15. “My brother, Zulius, and sister, Azeria, graduated from WPSD. I was there two years, ’87 to ’89, 8th and 9th grades.” At ASDB, she enjoyed freedom of communication and movement—a freedom that was denied at WPSD. Instead of ASL, there was a lot of Sim-Com. Students were required to wear hearing aids and punished if they forgot them. Girls were not allowed to play outdoors. Students were watched, regimented, and controlled. That’s why they called their school "Western Prison School for the Deaf." “Language deprivation and hearing control—we started to rebel. I found out about MSSD and transferred there. Five others transferred with me.” Zulius and Azeria stayed. But WPSD was furious about the “mass defection” and forbade Swanhilda to re-enter the campus. She attended Zulius’s graduation anyway, without incident. Zulius has four Deaf children with various hearing levels. They started out at Rocky Mountain Deaf School, “a wonderful bilingual school,” but after moving back to Pennsylvania, he decided to enroll them at WPSD, impressed with the improvements that had been made since he graduated. But there is too much Sim-Com, and ASL is ignored or discouraged. Swanhilda’s Deaf niece struggled terribly. Most of her classmates have cochlear implants and are oral. When one asked a question, the teacher would respond orally, without signing, so the niece was left out. Zulius observed and reported this to the school district (which supported him) and they had a meeting with WPSD officials. WPSD was told to either get an ASL-speaking teacher or an interpreter. WPSD balked. For 6 more months, during this battle, Swanhilda’s niece was language-deprived—and WPSD won’t guarantee her ASL access next year. So Deaf activists decided to start a hunger strike to call media attention to the situation (which is not limited to WPSD, but is common in schools for the deaf across the country). As of the February issue's press time, Swanhilda had lost 36 pounds. Her letters to WPSD have, as yet, gotten no response. The Pittsburgh Deaf community is divided, unwilling to make waves. In mid-December, Paula Busanic, who instigated the hunger strike, announced that she was withdrawing from the campaign, and urged others to stop fasting and to restrategize. But Swanhilda continues her battle for ASL access.